A man has been accused of torturing his girlfriend's eight-year-old son to death because he thought he was gay. 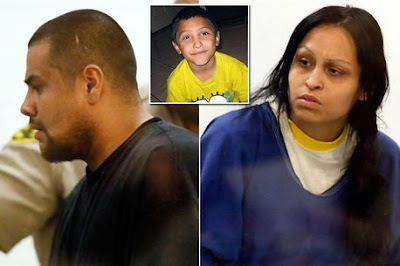 Isauro Aguirre and partner Pearl Fernandez allegedly bit, whipped and beat little Gabriel Fernandez in catalogue of horrific attacks at their home in Palmdale, California. In the months leading up to his death, Gabriel was covered with pepper spray, forced to eat his own vomit, regularly gagged to stop him from speaking and locked in a cabinet when he complained, the court heard. Fernandez and Isauro also burned him with cigarettes, whipped him, shot him with a BB gun, starved him and fed him cat litter. The boy was kept gagged and bound in a cubby until he was found, a Los Angeles County District Attorney's Office heard. When interviewed by police in the aftermath of his death, Gabriel’s siblings told of how they had to watch as their brother was forced by their mother and her boyfriend to eat cat faeces. Los Angeles County Fire Department paramedic James Cermak told the court he couldn’t believe what he saw when he responded to the 911 call of Gabriel in cardiac arrest at the couple's apartment. The boy was hospitalised, but he died two days late. Aguirre and Fernandez, who are on trial for murder and torture, will be tried separately. 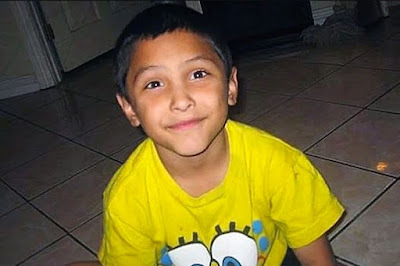 Four Los Angeles County social workers assigned to Gabriel's case also face charges in connection with the death.